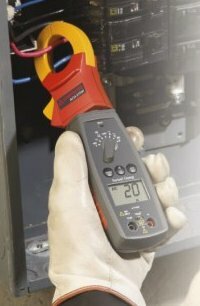 The RS-3 PRO works well in extreme temperatures down to 5°F, while digital clamp LCD screens tend to freeze. Amprobe’s ACD-10 PLUS meters offer thinner jaws over standard clamp meters, allowing access to tight measurement areas and still accommodating conductors up to 1 inch. The ACD 14 Plus is the professionals’ choice for both HVAC & Electrical applications due to its complete set of measuring features. 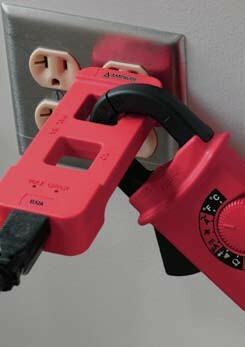 Its dual displays allows viewing amperage and voltage simultaneously. 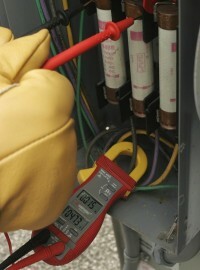 The RS-1007 PRO works well in extreme temperatures down to 5°F, while digital clamp LCD screens tend to freeze. Where accuracy, quality, and newest technology meet. 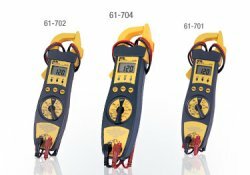 The ACDC-100 offers superior AC/DC measurement capabilities, highest product quality and enhanced ergonomics with Red, Rubber, RibsTM design. 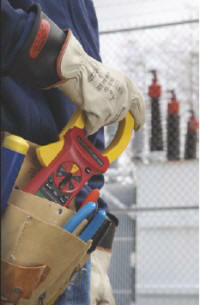 The TRMS version (ACD-100 TRMS) addresses needs of professionals who rely on performance and reliability. This CAT IV rated clamp is ideal for industrial applications and utilities that require an extra level of safety. Includes True RMS sensing for accuracy and dependability. Extra large jaw to accommodate wide diameter wires. The unique backlit display in the bottom of the clamp is an industry first. It enables an electrician to view measurement results in dark, bright or tight locations without difficulty or safety risk. 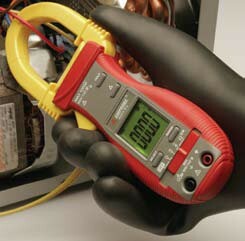 AC50A Leakage Current Clamp Multimeter - Current clamp multimeter for measuring low AC current in the microamps. 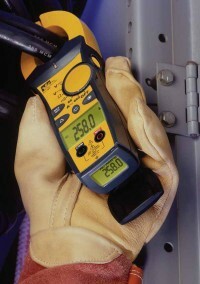 Great for applications requiring measurement of leakage and fault currents. Shielded transformer jaws open to 1.2"
The compact size of these meters make them ideal for taking general measurements on small conductors. Their excellent accuracy and resolution offer exceptional performance. No test leads or auxiliary electrodes needed! Use the on-board memory and data logging features to make your work more efficient. 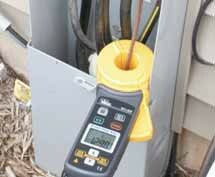 Test a Grounding System quickly and efficiently - without disconnecting the ground. No need for leads, auxiliary rods or spacing requirements. 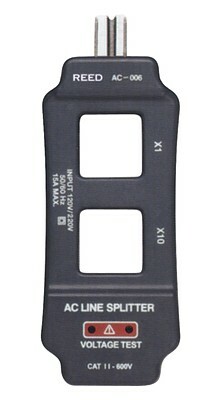 The AC-006 Line Splitter enables a clamp meter user to measure AC curent on a 2-wire or 3-wire power cord to 15A.